In my teach your kids to ski series from last season, we talked a lot about the process of getting your kids familiar with and interested in skiing, from the philosophical (promoting ski culture) to the practical (gearing up and dry land training). While I can't stress enough the benefits of these off-the-hill preparations, at some point, obviously, you're going to want to put your kids on snow. 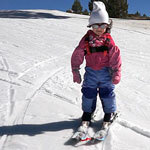 In the very youngest age groups—these would be toddlers who are walking but not yet able to dynamically change direction while running—"skiing" consists primarily of holding your child upright between your legs, allowing them to feel the sensations of skis sliding on snow and wind-in-their-hair. Both my kids loved this. My back did not. A chest harness with a handle on the back and an edgie wedgie make life a lot easier for both of you. Regardless, the point here is to very gently expose your child to sliding on snow. As such, it should be done only in the most favorable weather and resort settings, on the gentlest of pitches, and for quite short durations. An hour, including chairlift rides, would be my recommended upper limit. Avoid chairs if at all possible and stick to a magic carpet. The magic carpet is also where you want to start with your two or three-year-old. And something magic does indeed happen at this age: your kids will likely be able to stand on their own atop their skis and slide down without you holding onto them. No, they will not likely be able to stop or even steer. But they will slide under their own power, and they'll know they're doing it, and they'll be thrilled. So will you. Start with the magic carpet ride. Once again, board with them between your legs, holding the handle of their chest harness, which by now you've surely realized you need. Once you're both safely on the carpet and creeping upward, let go and allow your child to stand, on the magic carpet, on their own, feeling the motion and developing balance atop their skis. Kids tend to like the magic carpet ride as if it were a worthy sport all its own. Encourage this! In later stages, you can challenge them to try boarding/exiting on their own (with your help!) once they've become comfortable riding it. For now, your goal is to get them able to ride up with you standing close but not holding on. At the top, of course, you'll grab that harness handle again and ensure they exit safely without falling. Good job! You and your child are now standing atop the no-doubt fearsome pitch alongside the magic carpet. I suggest you take the following approach: hold the handle of your child's chest harness, put them between your legs, and ski down together, with you in a snow plow to keep your speed very slow. At this age your child is now old enough to realize something funny is going on. They will likely sag or even flop backwards into you, such that you find yourself holding their entire bodyweight. Say the words "Stand up tall!" as you gently try to keep them forward/centered, reducing your supporting force so that they start trying to stand up on their own. This is pretty much the whole ballgame, and if you've diligently done your dry land training, it's going to be a snap. When your child discovers they can stand up and slide on their own, it's one of those lifetime moments both of you will never forget. Remember: they can't stop. You don't want them crashing into fences at the bottom of the hill. So if you let go, keep yourself in very close range, and don't let go for long. Depending on your child's age and ability, here is where you'll start contemplating using a leash or not. There are good arguments in either direction. I say the most essential goal here is to have fun. In that regard, a leash for most two-to-three year olds is probably the wiser choice, working as appropriate to get rid of it as soon as possible (around age 3 1/2 to 4). That also goes for using the edgie-wedgie, although you may find it best to lose the leash first, keeping the edgie a bit longer for extra security. 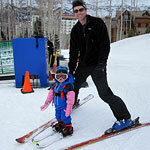 Finally, skiing with your child, in these early days, can prove to be an unexpectedly emotional experience. It takes a lot of work, off the hill, to make everything come together. But if you've done your homework, when you and your child do stand atop that first pitch for those very first turns, everything tends to come together. Don't shy away from the challenge of getting your child on snow—it's worth it. My daughters converted to the dark side and now snow board, where did I go wrong? Well there's still my son whose getting a link to this for his 2 week old-let the brainwahsing begin. Seriously we still all ride together love the whole family ski culture and ethic, thanks for the post.